IBF/IBO/WBA heavyweight champion Anthony Joshua (20-0, 20 KOs) has his main goal for 2018 in looking to win the last 2 heavyweight titles not already in his possession currently. Joshua came into 2017 with just the IBF heavyweight title that he’d won the previous year in beating American Charles Martin by a 2nd round knockout on April 9, 2016. In 2017, Joshua added the WBA and IBO heavyweight belts in beating 41-year-old Wladimir Klitschko by an 11th round knockout on April 29 at Wembley Stadium in London, England. Joshua, 28, is now poised to capture the WBO in his unification fight against Joseph Parker. That fight is being talked about for March 31 at the Principality Stadium in Cardiff, Wales. “What I’m hoping to achieve in boxing is consistency. In terms of all the belts I want, I could have all five. I fit three on this arm; I could definitely put another two on this arm,” said Joshua to the BBC Sport. “What I’d like to achieve next year is more sleep, in terms of getting to bed earlier. One of the nicest things that we were blessed with on Earth is getting a good night’s sleep. So honestly, getting a good night’s sleep,” said Joshua. Joshua-Parker could be announced this week. The purse split is already agreed on, and the only things that need to be finalized are a few smaller items. Joshua’s promoter Eddie Hearn says there will be a rematch if Parker beats Joshua or if the fight is competitive enough to interest the boxing public. The purse split for Parker will be 55 percent if he beats Joshua. Defeating Joshua is easier said than done. He’s fighting at an important level right now, and there might not anyone in the division that can beat him. Deontay Wilder and Parker both have a puncher’s chance. Tyson Fury could possibly out-box Joshua if he can get in good enough shape to recapture the form he had from 2 years ago in 2015. Parker will need to take a page out of the playbook that Wladimir used against Joshua by going after his chin and turning the fight into a mean brawl at some point. Waiting until the 5th or 6th round to mix it up with Joshua would be a clever strategy. If Parker tries to slug with Joshua in the 1st round, he might not see the end of the round. 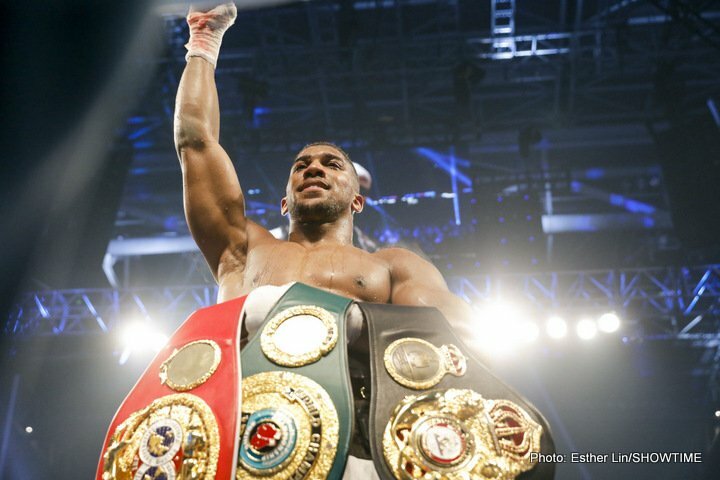 Capturing all the heavyweight titles is just the beginning for Joshua. The challenging work will involve trying to keep those belts for 10 years in the same way Wladimir did. Next boxing news: Deontay Wilder win over Ortiz make him No.1 heavyweight in division?